Gerard Cosmetics is an indie brand that has gotten really popular lately, especially on Instagram, where I see so many posts on the brand on there. So I couldn't resist, and started buying some Gerard Cosmetics myself, and ended up with a tiny collection of their lipsticks, lipglosses, and their Star Powder in Audrey. 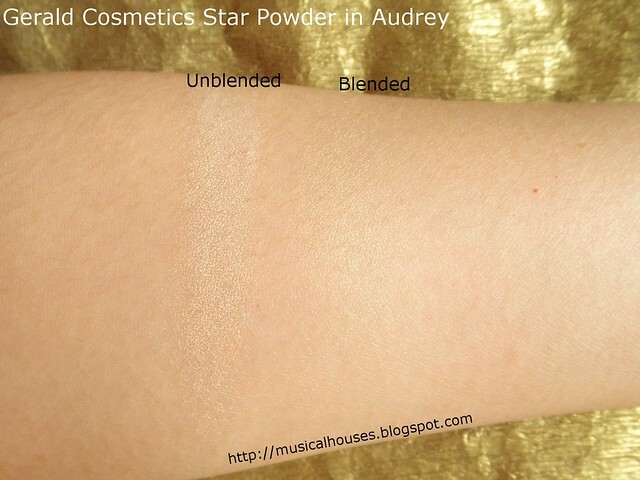 So, I thought I'd start by reviewing the Star Powder in Audrey first! Anyway, Gerard Cosmetics is available to purchase from their website, and while the prices seem a bit expensive at first glance, there are always codes floating around for various deals, e.g. a 3 for $25 lipstick or lipgloss deal. Anyway, the Star Powders have been getting quite a lot of love on Instagram, so I thought I'd get one for myself! Most of the shades were a little too dark for me (unless I was looking for a bronzer or blush), so I got Audrey, which is a beige champagne shade. As is my style, let's start with a quick look at the ingredients list, and then we'll go on to the swatches and reviews! I also did a comparison with one of the more similar shades of highlighters in my stash, too! The ingredients in this list are Mica, which is the main filler making up the bulk of this product, Jojoba Oil, Magnesium Stearate, which is a binder, and to hold things together, and Kaolin. There are also Iron Oxides and Titanium Dioxides which are there to give the product its colour. I'm not sure if this is a complete ingredients list, since it doesn't seem to have preservatives or anything like that, which was a bit surprising to me. While I know some indie brands don't use preservatives at all (for marketing purposes or whatever), but I always believe the health risk from preservatives is much lower than that of using spoiled product, and preservatives aren't even harmful in the first place (I've actually previously written a whole post explaining why parabens are safe). But otherwise, the ingredients are pretty usual for a pressed powder. Anyway, now that we've taken a look at the ingredients, let's move on to the swatches and review proper! I have to say, the gold packaging is pretty cool looking, especially in all those Instagram photos I've been seeing! 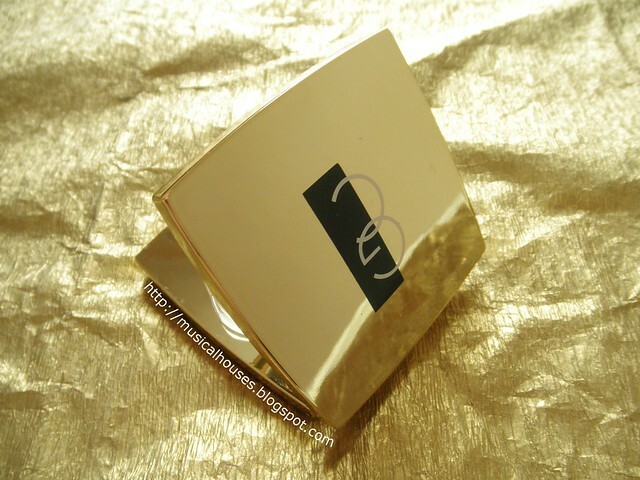 I have to say though, although it's gold, the packaging is still plastic-based, and it weighs a lot less than it looks. It feels and weighs more like plastic than actual "metal" gold packaging, although it sure looks cool! And now, we have swatches! As you can see from the swatch below, it's a gorgeous champagne beige gold shade. It melds quite well into my NC20 skintone, and gives off a subtle gold shimmer. I was actually expecting this to be more blingy than it was, but it turned out to be a really wearable shimmer, not OTT or too glittery at all! 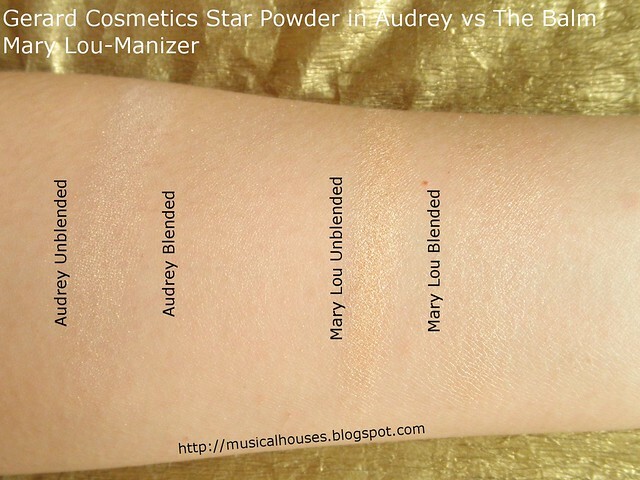 The texture of the Audrey Star Powder is on the harder side, and not as soft as some of the powders. It doesn't affect the performance of the product, though. Of course, since I have a bunch of highlighters lying around, I decided to try to see if any of the ones in my stash were dupes, or similar shades to the Audrey Star Powder. After some digging around, the closest one I found was TheBalm's Mary Lou-Manizer highlighter. As you can see, they look quite similar in the pan. Pardon the broken up Mary Lou-Manizer, I dropped it and it broke, and I'm using it up like this, and using up all the little bits! I know I could press the powder back into its case, but I've just been to lazy to do so. Haha. Once swatched, though, you can tell they look pretty different. 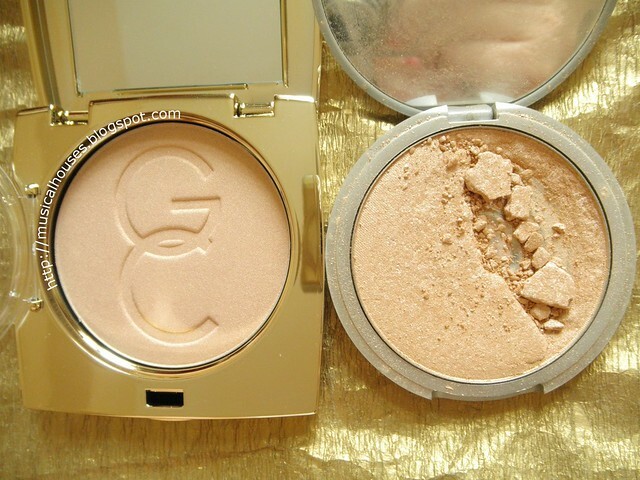 The base colour of the highlighters are different, with Gerard Cosmetics Audrey being a more gold base colour, while TheBalm Mary Lou-Manizer is more of a skinlike beige. Also, the shimmer level is different in both products. 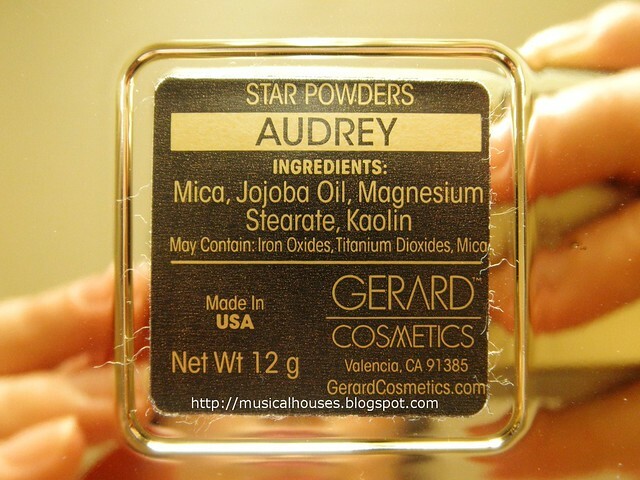 The Gerard Cosmetics Audrey Star Powder has a much more subtle shimmer, and you can apply quite a bit of this before you feel it is going into discoball territory. On the other hand, TheBalm's Mary Lou-Manizer is pretty darn shimmery, to the point of being frosty. You have to be careful not to overdo this one! And just to demonstrate the difference in finish, here's a second photo taken at an angle. 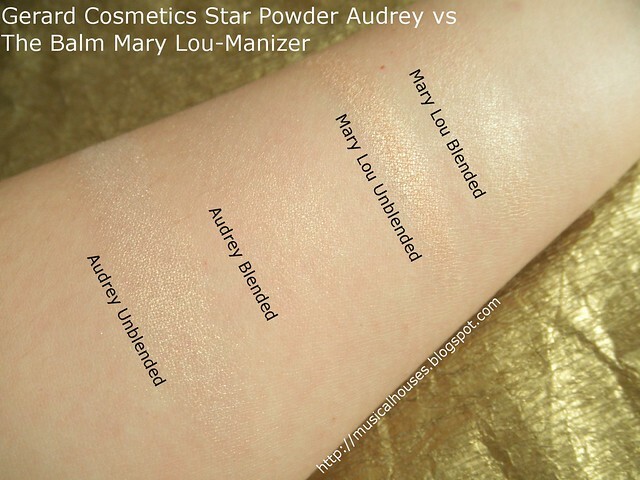 You can really see the difference in finish here - the Mary Lou-Manizer is seriously frostly from this angle, even in the blended swatch! 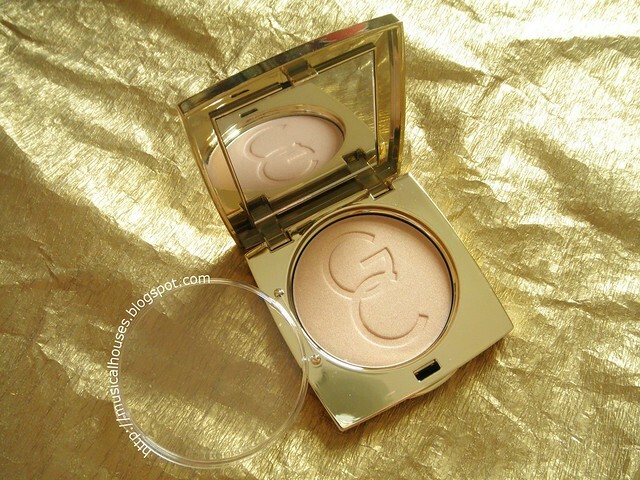 So, would I recommend the Gerard Cosmetids Star Powder in Audrey? I do like it, and I think for anyone who is looking for a subtle gold shimmer highlighter, this would be a good addition to their stash. 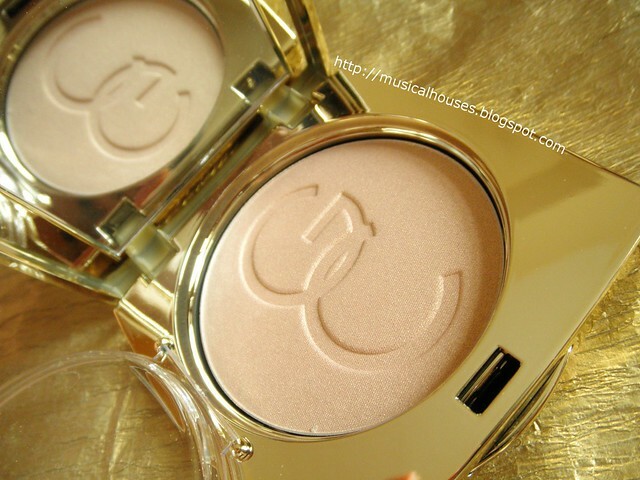 The gold shade looks good on most skintones, and it's pretty wearable for most occasions, since it's not too OTT. I think it's a pretty good shade to have in your stash - just wait for a sale code to float around before ordering! 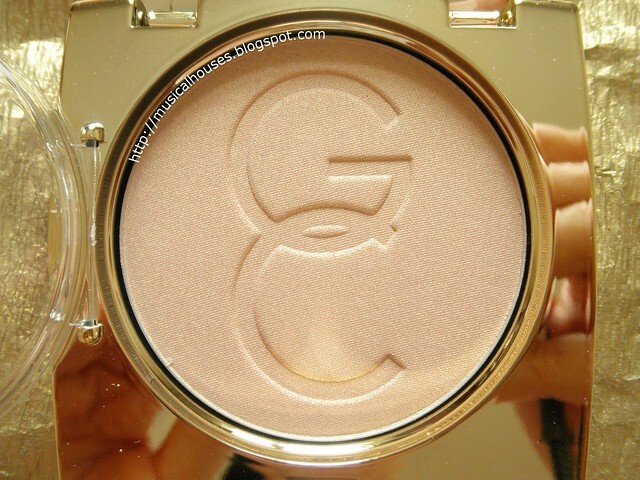 The Bottom Line: Gerard Cosmetics' Star Powder in Audrey has a subtle golden shimmer that would look good on most skintones. Never heard o this brand before but it looks beautiful! did you use their international shipping? was it thru post?